Small-scale organic agriculture has become increasingly popular in recent years. It’s an appealing business for a variety of reasons. For one, it entails a lot of working outside with your hands in a natural setting. Second, the demand for healthy, pesticide-free organic produce has never been greater. Lastly, it allows you to be your own boss and make decent money if you’re ambitious. Running a beekeeping business can be highly profitable under the right circumstances. If you’re serious about starting an apiary, you’ll have to do the following. 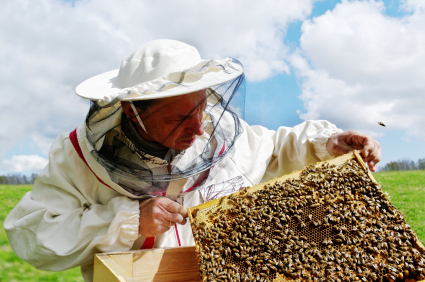 Above all else, it’s vital that you learn everything that you can about the art of beekeeping. Gaining a thorough understanding of basic beekeeping theory will require you to crack some books. Try taking a course at the agricultural extension of your local university if at all possible or get a mentor who’s already an experienced beekeeper. The web will obviously be a key educational resource. Join Google+ Communities and Facebook Groups focused on beekeeping. Find some online communities based in your area and pick the brains of local beekeepers for advice. Before you buy any hives or bees, you’ll need to come up with a rough idea of the ideal size and scope of your business. Look into zoning regulations in your area to make sure that there are no restrictions on beekeeping. Get an EIN from the IRS if you plan on hiring employees. Getting a business license from the local authorities is a good idea. At a minimum, it’ll take at least $500 to get going, so apply for business loans beforehand if you’ll need financial assistance. Creating an apiary isn’t actually that complicated. As for equipment, you’ll need some Langstroth hives , a stainless steel smoker, a hive tool and a beekeeping suit. Where you decide to set up your hives depends on a variety of factors. Be sure to site them in a shaded area so that they don’t overheat during the summer. You’ll need to hang sugar water feeders nearby to nourish your bee colony at the outset. Once you’re all set, you can populate your hives with bees. You can purchase the bees you’ll need from a variety of sources. One option is buying them online. Roughly 3 pounds of bees and a queen will run you about $100. You can track down vendors online via Bee Source. Alternatively, there are no doubt at least a few local suppliers in your area. Contact local apiaries to see if they’re selling any. However you get your bees, introducing them to their hives is a relatively quick and easy process. The two most obvious ways to make money from your bees is by selling honey and wax. Honey can be sold locally or online under your own label. Beeswax can be sold to candle makers and cosmetics manufacturers. In addition, you can further monetize your colony by offering pollination services to local orchards. If you find yourself with an excess of bees, you can sell worker and queen bees to other aspiring apiarists. Find what works best for you and expand your operation gradually as you go. As with any business, a good deal of your apiary’s success will come down to marketing and diversification. Be sure to network your way to greater exposure in your local area through farmers markets and CSAs. Use social media to advertise your wares and apiculture services. Join a local beekeeping association and work with peers to improve your business. Though there’s a definite learning curve to beekeeping, you’ll find yourself with more than enough business in due time if you remain persistent.